This is a delicious quick chicken curry; sweet, sour and aromatic full of flavour but not too hot. 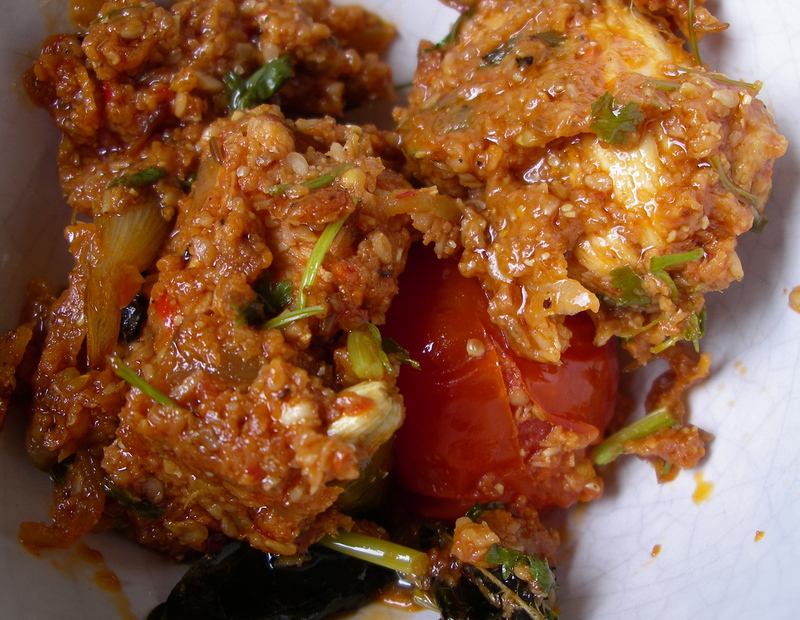 Chicken breast is marinated in a mixture of sour tamarind, sweet tomato, sesame seeds and coconut then cooked quickly in a karhi or hot wok with some wonderful aromatic Indian spices and fresh cherry tomatoes. Serve with rice for a simple family meal or with breads, raita and a potato or vegetable side dish for a great dinner party. Put the tomato passata and tamarind in a bowl along with the chilli powder, salt, sugar, ginger, garlic, coconut, sesame seeds, cumin and coriander. Stir well then add the chicken cut into bit size pieces stir well to coat then set aside. (at this point you could leave the dish in the fridge until it is time to eat so it is a great one to prepare in advance for dinner with friends so that you can concentrate on them and not cooking). Heat oil in a wide pan or wok and when hot add the curry leaves, nigella seed, dried chillies, and cardamom a few seconds later add the fenugreek seeds and fry until aroma rises. Lower heat and gently add the chicken along with the sauce, stir well and simmer gently for 12-15 mins. Add the fresh tomatoes and green chillies cook for 3 mins or until the cherry tomatoes begin to burst then add the coriander stir and serve. Source This recipe originally came from a book called The Definitive Cook’s Collection of Indian Recipes by Shehzad Husain and Rafi Fernandez that my um bought for Rachel. I liked the idea of up front prep then fast cooking method so have adapted it over the years. NB original recipe called for 4 tbsp tomato ketchup but I could not bear to use it myself, so I use pasatta or pureed fresh tomatoes.